Pretty cool idea! If you yank on the cable hard do you think that little hook would/could break? probably not. that cable is meant to keep the helmet from walking away. if you want to go into the convenience store for 3 minutes while taking a break from riding. if you are standing around in a large bike ground and you don't want to hold the helmet in your hands or on your arm but you don't want to keep watching your helmet every 30 seconds. keeps the helmet from hitting to ground which is cringe worthy for most of us. don't care what anyone says, the average thief will defeat this cable/lock and the better than average thief who spots the unfortunate rider who leaves his $1000 helmet while he goes into the shopping mall, 30 seconds....or less. LOL!!!! i respect that opinion however, with that logic, why even own a motorcycle.. in those SAME 30 seconds your Duc can be literally picked up into a van or truck and GONE. 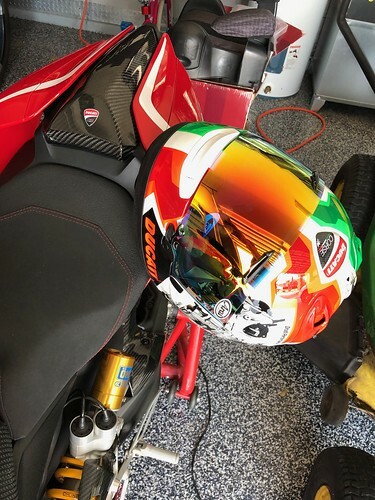 Not sure how trying to help fellow Ducati family members figure out a way to hang a helmet like every other bike has turned into something so crazy. its already understood what the risk are when u lock your lid to any bike (Regardless of cost), that same logic goes to owning the Ferrari of bikes which draws even more attention all on its own with no helmet... Damn the HELMET... I'll TAKE the Ferrari. I just want to know if that carbon cowl is an official Ducati accessory. Looks bling! I've seen them cut the strap ( which makes the helmet useless) thieves are stupid I wish we could shoot them on the spot . had a bike stolen loaded it in a van in 30 seconds and gone .